Experience HydraFacial™ Resurfacing Treatment, Mayoral’s Newest Skin Care Rejuvenation Procedure. Exfoliation, resurfacing, deep cleansing, hydration and blemish extraction is possible from one procedure. Yes! With Mayoral’s newest skin rejuvenation method called the HydraFacial™, anyone can enjoy the latest in a non-invasive, superior skin treatment that is safe for all skin types and offers immediate results. Soothing and cooling to the skin, HydraFacial™ represents the ultimate remedy for nourishing skin that is in poor health due to sun damage, excessive oil accumulation and age-related problems associated with reduced production of collagen and elastin. HydraFacial™ Resurfacing also improves enlarged pores, mild to moderate acne, fine lines and wrinkles and uneven texture and tone. Considered superior to Intense Pulsed Light therapy, HydraFacial™ is not a “quick fix” but provides lasting results due to the unique technology used to infuse the skin with peptides, hyaluronic acid and antioxidants. In addition, Mayoral Dermatology offers products specifically meant to augment the treatment at home and keep skin looking as fresh, youthful and radiant as it did following a HydraFacial™ procedure. Using a hand-held device equipped with a brush-like, vacuum-based tip structured to implement exfoliation and extraction of the skin, Mayoral specialists will maneuver the HydraFacial™ instrument over facial skin to remove dead skin cells and extract blemishes such as blackheads, whiteheads and bacterial cysts. During this stage of the procedure, the underlying skin is also being nourished with serums containing ingredients necessary for optimal skin health. Exfoliation of the skin removes dead skin cells that cling to skin when the natural shedding process is inhibited by decreased skin wellness. Although you cannot actually see skin cells accumulating on the skin, the dullness, dryness and and “washed-out” appearance of your skin is the result of cells dying and remaining on the skin. The HydraFacial™ exfoliation technique employs a gentle but effective vacuum-abrasion procedure that unclogs pores so that pore size and blemishes are reduced in size and frequency. In addition, exfoliation stimulates renewal of skin cells so that fresh, healthier cells force old cells to fall off the skin. HydraFacial™ Resurfacing treatment also dramatically improves the appearance of fine line and wrinkles incited by premature skin damage. This is because exfoliation and hydration smooths skin and provides much-needed moisture to dehydrated skin layers that require continuous hydration for optimal production of collagen and elastin. In addition, by removing dead skin cells, exfoliation further improves the appearance of wrinkles made to look more pronounced by accumulated layers of these defunct cells. A naturally occurring substance found in human epithelial and connective tissues, hyaluronic acid offers rich, lubricating qualities that not only contribute to skin suppleness and health but also to repairing skin tissue damaged by repeated sunburns or normal exposure to ultraviolet radiation. Ten years ago, the U.S. Food and Drug Administration approved the use of hyaluronic acid in dermal filler injections such as Restalyn and Juvederm for the elimination of wrinkles, folds and fine lines that define minor or moderate scarring. By adding moisturizing volume within the epidermis and dermis, hyaluronic acid effectively “plumps” skin so that it appears smooth, evenly textured and youthful. Hyaluronic acid incorporated into a HydraFacial™ Resurfacing treatment also promotes growth of keratinocytes ( a type of skin cell functioning to inhibit environmental damage to the skin) and increases levels of retinoic acid, another substance contributing to skin hydration. Collagen synthesis is stimulated as well, which supports skin integrity by enhancing the structural matrix composing the skin’s tissues. Mayoral Dermatology skin specialists use Vortex-Fusion® technology to apply antioxidants to the skin during a HydraFacial™ treatment. Harsh, elemental entities such as the sun, pollution, cold air and poor quality skin products ravage our face every day by importing free radical molecules into the skin’s matrix. Free radicals are molecules that destroy other molecules beneficial to our health. The skin is especially vulnerable to free radical damage because it is constantly exposed to the destructiveness of the elements and the free radicals comprising these elements. Experiencing a HydraFacial™ procedure infuses your skin with powerful antioxidants that neutralize and destroy free radicals while providing a layer of protection for your skin. Antioxidants also improve cell functioning so that the skin can engage in a process of continual renewal to give you consistently healthy, glowing skin. Immediate results are noticeable following an initial HydraFacial treatment, with less oil, even texture and cleaner-looking skin being reported upon completion of the procedure. Unsure whether HydraFacial™ is right for you? 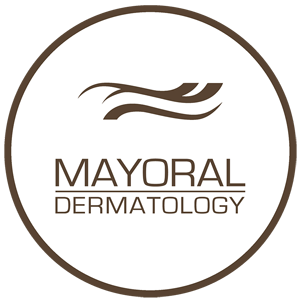 Call Mayoral Dermatology in Coral Gables today and talk with one of our skin specialists about this revolutionary rejuvenation skin treatment. We will be happy to answer all your questions or schedule a consultation appointment with you to provide further information about HydraFacial™ Resurfacing technique or any one of the many cosmetic dermatological procedures we offer.